﻿Carolyn Meyer appeared at Alamosa Books last Saturday to talk about her latest installment in the Royals Series - The Wild Queen: The Days and Nights of Mary Queen of Scots. Carolyn told how young Mary left Scotland at the age of 5 to be raised in the French court, as she was betrothed to the future king. 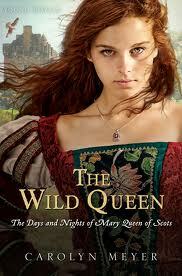 After being widowed as a teenager, she returned to Scotland to rule a wild and unwieldy country. 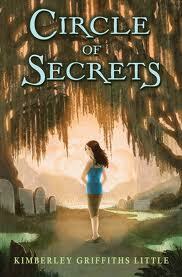 Here are some excerpts from the School Library Journal Review. "The scheming and rivalries of Scotland are covered in such a way that the novel makes complicated history accessible and intriguing... Vivid descriptions of her education and socialization at the French royal court display the author’s extensive research." Carolyn's discussion of her research was fascinating. She knows her subjects well, and tries to visit the countries she writes about whenever possible. She weaves in so much detail, it's hard to believe she wasn't actually present as the historic intrigues unfolded. I'm currently writing a novel containing many historical elements, so I know how time-consuming such research can be.Not only is Carolyn a master at recreating history, she does it in such a way that she makes history extremely accessible to teen readers. The intense accounts of love, betrayal, jealousy and revenge rival the drama of a Jersey Shores episode, but with style and class... and proper English. To give an example of how accessible her books are for young readers, I'll share a personal example. I was recently sitting in my living room reading The Bad Queen: Rules and Instructions for Marie Antoinette, when my teenage daughter walked in and said, "I recognize that book. I read it. It's really good." What is noteworthy is that my daughter hates reading, and she hates history. I can't count the number of books I've given her, praying to instill a love of literature, hoping she would find among the pages characters who spoke to her. 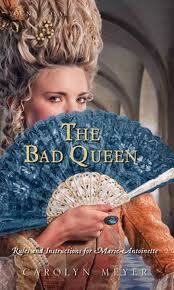 If done well, historical fiction can do that. Carolyn does it well! I was browsing the bookstore shelves, looking for another book on philosophy to send to my son who is working at a summer camp with no TV and very little internet, when I came upon this little gem, The Tao of Pooh by Benjamin Hoff. It's only 158 pages, so I took the liberty of reading it before mailing it off to Colorado. "Pooh hasn't much Brain, but he never comes to any harm. He does silly things and they turn out right." 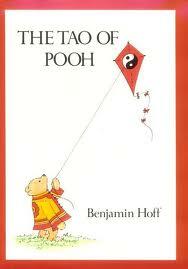 A similar concept Hoff explores is the Wu Wei, or as he calls it, the Pooh Way "without doing, causing, or making." He compares it to water flowing around the rocks, rather than trying to force a straight path through them. Tao literally means "Way," and he contends that going with the flow and listening to our intuition gives us a Sensitivity to Circumstances that helps guide our path. Now that it's summer, its easier to believe that life can be so simple. I just hope I remember the lesson come September. Have you ever felt as if you were being led to a book? A couple of months ago my work laptop started malfunctioning. I took it upstairs to our Information Technology (IT) department which happens to be located in a room inside of our media center (aka: library). As I hung around in the library waiting for the laptop problem to be ascertained, I started looking through the books on the shelf outside of IT. I happened to find myself in the philosophy section. This peaked my interest because although my son rarely read for pleasure, during his senior year in high school he developed a keen interest in philosophy and read many books on the subject. This spurred several interesting and thought provoking conversations during long road trips when we were visiting colleges. Needless to say, as I found myself in the philosophy section of the high school where I work, I began exploring the shelves with great interest. One particular book caught my eye. It was Viktor E. Frankl's Man's Search for Meaning. The book had been recommended to me in the past, but I had never read it. As I began thumbing through the pages, I discovered the incredible true story of a Jewish psychiatrist who found himself imprisoned in several notorious Nazi concentration camps during world War II including Auschwitz. I checked out the book, took it home, and ended up reading it in one night! I don't remember what was wrong with my computer, but the story of Frankl's struggle to maintain hope and dignity in the most oppressive of circumstances will be something I will remember forever. The first half of the book chronicles his concentration camp experiences and his struggle to find a reason to live. The second half of the book explores the theory of logo therapy that he developed, in part, based on his concentration camp experiences. Something that was crucial to his survival was finding meaning in every moment. Even in suffering we all have choices. He says that we can't avoid suffering but we can find meaning in it and choose how we deal with it. "We who have lived in the concentration camps can remember the men who walked through the huts comforting others, giving away their last piece of bread. They may have been few in number, but they offer sufficient proof that everything can be taken from a man but one thing: the last of the human freedoms--to choose one's attitude in any given set of circumstances, to choose one's own way." It's no wonder this book has sold over twelve million copies in twenty-four languages. This summer between semesters, my son found a summer job working at a camp in Colorado. There is no TV, no cell coverage, and one computer with Internet access that must be shared with all the staff. As I was considering what to send him that wouldn't get eaten by the squirrels or be difficult to pack on his return trip back to college in the fall, I thought of Frankl's book. Thanks to amazon.com shipping, this fascinating story is now on its way to Colorado. The summer I turned eleven, I found out that ghosts are real.